In a runaway victory, the Lady Mustangs took down the Coyotes in straight sets, 25-11, 25-16. Brenley Fredette and Makayla Estes were spectacular on defense as Walker Butte was unable to mount a comeback. Lindsay Lopez had an 11 point run of serve and the Mustangs setter, Trinity Harris, played a brilliant and nearly flawless game. The girls played their best game so far and remain undefeated going into the Final. Come support your team on Friday at Florence High School for the Final. The game starts at 5:00 p.m.
On Wednesday, March 4, the Title One Program held Books for Bingo at Magma Ranch. This event was free to all students and parents. The purpose of the night was to inform parents on how they can help their children when reading at home, as well as help facilitate a love of reading for their children. The night began by giving away nachos to everyone attending! A short presentation was lead by Jessica Rieboldt and Jessica Robinson, Magma Ranch Title One teachers. The presentation included a short video on what parents can do to help their child with reading. Five tips were given and examples of each. These included: Sit side by side with your child while reading, don't "tell" the words, move beyond "sound it out" and incorporating reading strategies, reread for fluency and allow some mistakes to go uncorrected. Many parents want to help their children, but just don't know how. This video helped bridge that gap. The families at Magma Ranch each made a "Reading Pledge". They discussed as a family, how they can pledge to read each day. Some examples included, "We pledge to read for 20 minutes together as a family and discuss what we read" and "We pledge to read one new book every week". The pledges were then put up and displayed in the cafeteria. As everyone played BINGO, winners received a free book of their choice. By the end, all students left with at least one book! This was a very successful night at Magma Ranch! Parents walked away with resources to use to help their children. Students left with smiles on their faces and books in their hands. Everyone at Magma is committed to help make a difference, and help children become lifelong learners! All winners listed below will compete in the FUSD District Science Fair next Tuesday and in Tucson at the SARSEF Fair in Tucson in March. The Lady Mustangs continued their winning ways yesterday on the volleyball court and beat the Florence Gophers in straight sets: 25-15, 25-23. After taking the first set handily, the girls got shaken and fell behind Florence 19-11 in the second set. But, then the team decided enough was enough. Lindsay Lopez took the reins with 10 straight service points and, with some good team defense, helped bring the Mustangs back and win the day. Congratulations to John Baran, 6th grade student, second alternate to state spelling bee.Thank you Mrs Foster, Mrs Archer and Mckane for all your hard work! Poston Butte High School Student Council donated gift cards worth of $500 dollars to Larson family who lost their home in a fire this week. Thank you Poston Butte family! 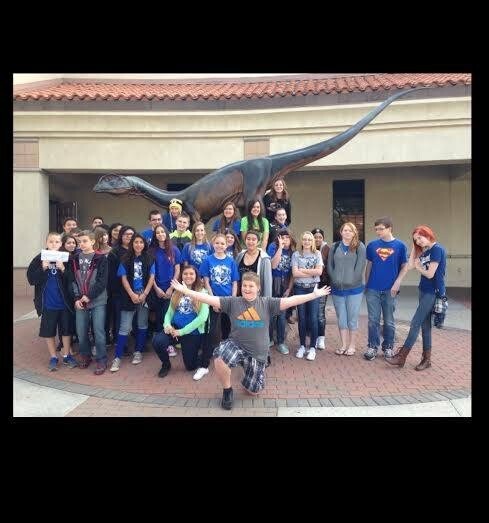 This field trip was for National Junior Honor Society to learn while having a great time. This museum visit taught students about Arizona’s history and culture. Some of the highlights of the trip were to pan for gold and students were able to visit former jail cells from Phoenix. Congratulations to the 2015 Mustangs Football Cheer Team! Everyone worked very hard this week to learn the cheers and jumps required to make the team. A BIG THANK YOU to Mrs. Stang and Mrs. McKane for judging our tryouts! They will also be helping our team this season with preparations for our competition in March. We will be holding tryouts for Alternates today, Friday, and Monday. If students are interested in trying out, please have them report to the cafeteria today at 3:30 PM. If anyone has questions, please have them Mrs. Olsen. the volleyball team this year. The second quarter awards assembly was done in the gym on January 9, 2015. Students were awarded for their outstanding academic performance and perfect attendance to school. Some teachers also received perfect attendance award. Students who participated and sold more than ten (10) boxes of cookie dough in the Magma Ranch Cookie Dough fund raising had the chance to play games in the Game truck this week. Robotics club did a great job in the regional tournament in Mesa while the entire state was watching them through live stream. They scored between 18-22 place, out of 34 teams in robot games; project and robot judging scores have not been added to the final score yet. The members showed the spirit of team work and perseverance, with the programming skills and creative invention of “New Age Helmet”, a helmet programmed with electrodes that send signals to the brain creating 3D images, has speech-enabled capability and provides information such as composition, thermo, measurements, and other information of any object focused on the attached camera. It is solar-powered with rechargeable battery as a back up but made of 3/4 aluminum (for lightness) and 1/4 iron (for durability). A website has been created for more information about it. They received their medals from FLL. Their first year of participation was very impressive and they will take their learning to the next level for next year’s tournament. The Student Council is hosting non-perishable food drive to benefit the community from December 1-10. Please bring any non-perishable food items or toiletries for your grade level. The winning grade level will earn a cookie and hot chocolate party. Our Mustang boys soccer team faced the Skyline Ranch bull dogs yesterday here at home. The Mustangs came out with their strongest first half of the season. The score going to halftime was 6-0. Skyline added one goal in the second half while the Mustangs added two more. Goals came from Juan Meraz, Uzziel Martinez and Elijah Kaaihue. Adam Paul netted two beautiful free kicks for goals, while Brian Krizan scored a hat-trick...that's right 3 goals! The mustang boys proved they are now ready for the playoffs with an 8 to 1 victory over the Bulldogs. Our Lady Mustangs faced the very strong Skyline Bulldogs yesterday on the Skyline field. Our ladies fought hard during the first half with Heidy Calderon, Lucrecia Galicia, and Angelina Rey running a strong defense. Tatum Gilliam, Trinity Harris, and Kathy Murillo took charge on the field pushing into the Skyline defense with many shot attempts. Alyssa Brizuela made an awesome save against Skyline’s penalty kick but the half ended with the Bulldogs in the lead 2-0. The Mustangs came back with a vengeance, with Heidy Calderon, Stephanie Zazueta, and Jovana Contreras pushing back the Bulldogs. A penalty against Skyline gave the Mustangs their first goal by Trinity Harris. The Bulldogs fought back and a collision between Lucrecia Galicia and the opposition unfortunately took her out of the game with an injury. Tatum Gilliam was brought back in as forward and the Mustangs pushed back to allow Trinity Harris to score our final goal of the game. A well-fought effort yesterday but Skyline won 3-2.
for our Magma Ranch families. This was a great way to help our families learn more about math strategies that they can use at home with their students. The highlight form of the assembly was when Mr. Barry spoke to a packed house of students. They gave him the respect he earned by not talking but listening to his story as he served in World War II! He told them how he went from Africa to Italy to the heart of Germany and how he was in the capitol when Germany surrendered. The crowd gave him a standing ovation when he was done. All of our grade levels had musical numbers and we honored our guest who were veterans with a certificate. Lieutenant Thomas from the Pinal County Sheriffs Office made it to the morning assembly we are grateful to have him there. The Poston Butte Military Club posted and retired the colors for each assembly. Thank you Dr. Richards for letting them come be a part of the assemblies. Mrs. Melessa our new choir/music teacher organized the whole event and she did a great job. We gave everyone in attendance a flag and our patriotic spirit was strong. Our veterans who attended thanked us for organizing this event to recognize them. Our students need to see why it is so important to be grateful for what we have and the free nation we live in. Students from Ms. Turner used bubbles to calculate the area of circle. A fun way to learn math! Magma Ranch parents and students received information from Ms. Brooke from SARSEF (Southern Arizona Regional Science and Engineering Fair) about the expectation and preparation of the science fair projects. Our boys soccer team faced the circle cross cheetahs yesterday. It was a great game. CCR scored the first goal of the game and lead at halftime 1 to 0. Coming out in the second half our boys scored two goals. CCR had an opportunity with the penalty shot that sailed over the top of the crossbar. Uzziel Martinez scored two goals assisted by Brian Krizan to put mustangs on top. A couple of great saves by Michael Warnick kept circle cross scoreless halfway into the second half. Adam Paul had a great shot off the crossbar but unfortunately did not go in. Circle cross had a second penalty shot that they scored. Magma ranch add their third go ahead goal again by Uzziel Martinez again assisted by Brian Krizan. The lady Mustangs played a tough game against CCR. We lost 2-1. Stephanie Zazueta scored the team's goal and had several other players had shots on goal. Alyssa Brizuela had some incredible saves! Mustangs, let's play hard on Thursday against Skyline!!! Mustangs made Mr. Lopez wore high heels! It was a race and lots of fun. The zombie fashion show was the high light of the assembly with the 8th grade winning back the spirit stick this quarter having the loudest howl like a werewolf. Yesterday, girls soccer team played a close game against Florence, ending the game with a score of 1-1. The team played hard and had many assists and shots on goal. Trinity Harris scored the point for the Mustangs. The boys soccer team faced Florence K8 gophers yesterday at Florence. Our defense was strong with special efforts from Elijah Kaaihue, Joel Mendoza, Anthony Hernandez, Jose Lopez, and Alberto Varela. Our keeper had a few nice saves - nice job Michael Warnick. He helped to shut out the gophers yesterday. Our Magma boys dominated shots on goal and had several opportunities that just missed. Fantastic forward effort from Brian Krizan yesterday! Magma wins with one goal from Uzziel Martinez and two goals from Adam Paul. The final score 3-0. Our boys soccer team faced the Anthem Eagles yesterday. The game started out slowly until about the middle of the first half when Uzziel Martinez netted the first and only goal of the first half. With the score 1-0 at halftime our boys needed to regroup as one. Second half was a goal scoring spree for Magma Ranch. The boys added seven more goals: 1 by Juan Meraz, 2 by Adam Paul, 2 by Brian Krizan, and 2 more goals for a total of three for the game again by Uzziel Martinez. The final score was 8-0 as Magma blanked the Eagles of Anthem. The girls played an exciting game against Anthem! We beat the Eagles 4-3. Stephanie Zazueta scored 3 points and Trinity Harris scored the 4th. The team played well and communicated with each other. Alyssa Bruzela saved the team in goal, blocking many great shots. Lucrecia was a huge asset to the game as she played aggressively on the field, giving it her all. The boys team faced Walker Butte here at home yesterday. Mustangs went down 1-0 early in the first half. Shortly thereafter Uzziel Martinez equalized, followed by a go-ahead goal from Adam Paul just before halftime. In the second half our Mustang boys really came together as one team. They added four more goals with one coming again from Uzziel another from Adam and two from Juan Meraz. The Mustangs won 6 to 1. The Magma girls played an impressive first game of the season! We tied 2-2 against WB. Tatum Giliam scored the first goal in the first minute of the game! Alyssa Brizuela blocked several goals and relied on our defense for support. Our second point was scored by Stephanie Zazueta. Way to go Mustangs! Last night, October 16th, Magma Ranch celebrated Fall Festival. Attendance was amazing (shoulder to shoulder in the hallways) and a lot of fun was had by all. On Tuesday, October 16th in the cafeteria, during the school day, the 6th to 8th grade students had a performance for their peers and parents. The play took place during the middle schoolers’ 1st and 2nd periods. Parents,players and coaches had a Sports meeting last Tuesday, October 14, 2014 at the Cafeteria. Coaches discussed about the expectations for the season. The school's Robotics Club received the materials to prepare for the First Lego League 2014 Competition from the Lego Foundation grant. Sixth grade Science students constructed egg packaging using household materials. The students tested how the packaging material they have constructed can keep raw egg from breaking after releasing from a height of two (2) meters. The awards assembly for the first quarter was done in the gym today. Students received their awards for their successful academic performance. Some parents joined during the assembly. Magma Ranch students participated in the Cookie Dough Kick Off assembly. This fundraiser helps to purchase playground equipment and support students' field trips. For the second year in a row the Magma Ranch Mustangs are the softball champions of the Florence Unified School District. Officers of the student council (StuCo) accepted the Florence K8 Ice Bucket Challenge and donated $110.00. Mrs. Huston and Ms. Mahlum are the advisers of the StuCo. This Data Wall visually graphs all of Mrs. Matuszewski's Title 1 student's weekly progress. Each grade level K-5 is progress monitored weekly in a specific area of focus. Each grade level group is aware of their goal in reading. The data wall gives students a visual representation of their goals and weekly progress. This has been an extremely motivating tool in her classroom for students to reach and surpass their reading goals! Lindsay Lopez pitched magnificently giving up one hit and striking out 13 Walker Butte batters as the Mustangs are back in the softball finals for the second year in a row. Kayla Lopez, Raevyenn Appodaca, Makayla Ettes , Alyssa Brizeule all made nice defensive plays behind Lindsay. Natti Murilo, Kayla, Makayla all scored 2 runs and Lindsay and Kaylynn Ohlund both scored once. Lindsay belted a home run, a double and a single. Kayla, Makayla, Alyssa, Natti and Kaylynn all hit singles. Brenley Furdette and Raegon Maloy played strong in right field. Stephanie Ortiz was tough pinch hitting. Trinity Harris anchored the infield at third. Samantha Keefe continued her progress as the next slapping hitting star at Magma Ranch. Great win girls, now practice hard for Tuesday's championship game . Go Mustangs! Ms. Varney's class stayed on the grass in a circle right next to the playground long enough for EVERY student to share a living or non living thing they saw. Last night, the boys baseball ended their great season with a 13-4 loss vs. the Circle Cross Cheetahs. Our Mustangs jumped out to an early 2-0 lead but could not hold on to the lead and make the necessary plays. The offense was led by Jake Malloy and Alex Archer who both hit the ball well last night. The boys finished the season with a respectable 4-5 record however with such a young team the Mustangs will definitely be contenders for the championship next season. Students from the 6th grade created weather forecasting video project in Science. They collected weather data for two (2) weeks and developed their own weather forecast for three (3) days based on the trends and patterns in the weather data collected. Each group worked on a city in Arizona including Casa Grande, Coollidge, Flagstaff, Payson, Scottsdale, Yuma, Tempe and Chandler. The entire school participated with the lip dub of the song "Top of the World". Students prepared costumes, banners, and other materials to show their Magma spirit. Balloons were released and filmed from the roof top at the end. Students had the opportunity to purchase from the Student Council table that was set up next to the cafeteria. They stayed at the playground or played in the field during their designated times. The lady Mustangs unleashed their three pitchers last night. Lindsay Lopez pitched one inning and struck out the only three batters she faced. Raevynn Apodaca pitched two innings and struck out 5. Alyssa Brizuela closed out the final inning striking out one.Trinity Harris continued her fine play at third and made her catching debut catching two innings. Natti Murillo and Raegon Maloy displayed their vesatility by playing outfield and infield. Syephanie Ortiz, Kaylynn Ohlund and Samantha Keefe showed their speed in the outfield. Offensively the Mustangs were the beneficaries of 14 walks plus 7 hits resulting in 17 runs. Lindsay belted a home run. Raevynn a double and a single. Alyssa had two singles and Trininty added a single. Makayla Etes smacked a single and scored 4 runs. Kayla Lopez, and Raeyvnn scored 3 runs. Lindsay and Natti scored twice. crossing the plate once were Brenly Ferdete, Alyssa and Trinity. Next game on road at Walker Butte. Congratulations to the Mustang Baseball team on another big win last night against the Anthem Eagles! After losing their first 2 games the Mustangs have won 4 straight and moved into a tie for second place in the District. Yesterday's big win came on a brilliant pitching performance by Octavio Flores and Toby Story. The two of them combined struck out 6 batters and only gave up 2 hits in the 11-4 victory.The Mustangs were lead at the plate by Alex Archer who went 2 for 2 with a single, double, and 2 walks. Michael Keefe had 2 big RBI's in the first inning to get the Mustangs going. Gabe Story, Pierce Rogers, and Jake Malloy also contributed with some timely hitting of their own. Come watch the baseball team take on the Coyotes tomorrow. Our boys will be looking to get even with the Coyotes and move in to a tie for first place with a win. With an improving Mustang defense behind her, Lindsay Lopez struck out 8 batters, gave up two hits and walked no one. The Mustang bats produced enough fire power to score 8 on an off night for the slugging Mustangs. Terrific defensive plays were turned in by Kayla Lopez, Trinity Harris (2), Raevynn Apodaca, Alyssa Brizuela, Lindsay and a dramatic catch by Brenely Furdette topped the defensive efforts. Offensively Lindsay cracked a home run, a triple and a single in three at official at bats and scored 4 runs. Raeyvnn went two for two and scored one run. Kayla walked twice and used her quicks to score twice. Makayla Etes bounced back after a rough at bat, to single and score a run. Kaylynn Ohlund reached base three times, Mckenzie Martinez and Natti Murillo shared left field perfectly....Samantha Keefe and Raegon Maloy were barely out on infield grounders off their fast pitcher. Stepanie Otiz did a good job courtesy running for Raevynn. In a rematch of last years championship game the boys baseball team once again finished with a big win over the Florence Gophers! The game started with some great pitching again from Jr. Lopez who picked up his third win on the mound. Great defensive play from Mark Mora, Gabe Story and Colton Kerr helped keep the Gophers to only one run through four innings. Colton Kerr was brought in to pitch in the 5th inning and did a great job staying in the strike zone. Unfortunately a few miscues in the field forced the coaching staff to pull Colton and call on Jake Malloy to come in an close out the Gophers in the fifth inning. Great hitting and base running was on display for the Mustangs who stole 9 bases without being picked off or thrown out. Jr. Lopez both hit the ball hard in this contest, and Ocatavio Flores did a great job making contact in the 3rd inning to drive in a couple runs for the Mustangs. We are so Proud of our Baseball and Softball Teams! Boys baseball won again last night, Thursday, August 21, in a hard fought battle with the Circle Cross Cheetahs. Colton Kerr started the game on the mound and threw for 3 solid innings setting up Jr. Lopez to pitch the final 3 innings and get his 2nd win for the season.The game went back and forth with 4 lead changes but in the end timely hitting and good defense paid off for the mustangs. Pierce Rogers had a great game going 1-1 with 2 walks and scoring 2 runs for the mustangs. Jr. Lopez and Jake Malloy each had a pair of hits and a pair of stolen bases to lead the charge. Great defensive plays for the game were made by Alex Archer and Jr. Lopez throughout and Gabe story finished the game with nice play at 2nd base.The Mustangs have 3 big games next week as they try to continue their climb up the standings. Lady Mustang Lindsay Lopez gave up two hits and struck out 11 Cheetahs and Alyssa Brizuela struck out one with an assist from Makayla Etes and Raevynn Apodaca as the Mustangs cruised to a 16 - 1 victory over Circle Cross.Makayla had three hits including a triple. Lindsay had two hits , Raeyvnn and Natti Murillo had si ngles. Natti's was a blast down the third base line.Kayla Lopez scored 4 runs, Lindsay, Raeyvnn, Alyssa,and Makenzie Martinez scored 2 runs each. Single runs were tallied Kaylynn Ohlund, Breneley Ferdette, Makayla and Trinity Harris. Stephanie Ortiz had a tough, exciting at bat against Circle crosses number 1 pitcher, Raegon Maloy and Samantha Keefe patrolled the outfield and competed well at the plate. Boys baseball was back to championship form last Tuesday, August 19th, with a much needed win over the Skyline Bulldogs. A great mix of hitting and defense paved the way for a 20-0 blow out. Mustangs had outstanding pitching performances by Jr. Lopez and Octavio Flores who combine for a 1 hit shutout. The pitchers had some great defensive plays behind them from Michael Keefe and Will Ball who both caught line drives off the bats of the bulldogs to protect the shutout. The Mustangs were just as dominate at the plate. A first inning Grand Slam over the left field wall by Jr. Lopez gave the boys a huge 11-0 lead in the first inning. Pierce Rogers, Jake Malloy and Michael Keefe also provided clutch RBI hits at the plate to contribute to the win. Be sure to come out and support the boys baseball in their next home game against Circle Cross on Thursday. Softball Mustangs had three throwing strikes last Tuesday too. Lindsay Lopez struck out three, Raevynn Apodaca struck out three and Alyssa Brizuela struck out two and they combined to throw a two hitter. Mckenzie Martinez scored three runs as did Reavynn , scoring two runs were Kaylynn Ohlund, Kayla Lopez and Alyssa. Scoring one run including Makayla Etes, Raegon Maloy, Lindsay, Trinity Harris, Samantha Keefe and Brenely Ferdette. Stephanie Otiz made her debut in right field, Makenna Stauffer debut in left field and Natti Murilo made a great stop at the hot corner. Raeyvnn and Samantha each got slap hits, Samantha Keefe is the newest Mustang slapper and she belted out two slap hits. Raevynn also added a conventional single. Alyssa had two hits, one was a double that drove in three runs. Trinity added two hits and Brinley and Kayla each belted out one hit. The school received Energy Star award for this year during the the board meeting held yesterday, August 13th. This awards shows the united efforts in the school in conserving energy. On Wednesday, August 13th the S.M.Art Club (Student Mentored Art Club) met to learn about Picasso’s Cubism. The students were able to discuss different pieces of Cubism such as ‘Violin and Candlestick’ by Braque as well as ‘The Old Guitarist’ and ‘Three Musicians’ by Picasso. Following the discussion, where the students were able to talk about what they saw in the art pieces, the students were then able to work on their own versions of Cubism by tearing pieces of paper and experimenting with the geometric shapes created to produce a masterpiece. A step-by-step process to a creating a cubism self-portrait was shown on the SMART board as another option for students to dive into some different art forms! We had a great meeting and look forward to our next meeting on August 27th where we will have students present step-by-step processes in creating art that THEY like to draw. Title 1 Ice Cream Social! About six hundred parents and students attended the Title 1 night held yesterday, August 11, in the school cafeteria at 6:00 to 7:00 PM. This great opportunity provided the parents with free resources to help their children with Reading. Parents and students enjoyed the ice cream with a selection of various toppings, after the presentation. The night was a success! Thank you to Mrs. Matuszweski and Ms. Riebolt, Title 1 teachers for leading this activity. Great things are happening in Magma classrooms ! Ms. Gilbertson is using Class Dojo in 5th grade. Mrs. Pagarigan's students in 6 th grade conducted a temperature lab and recorded results. Mrs. Page's class memorized a poem to help them with math rounding. Ms. Garcia helps ELL students with phonograms. Students have been selling ice cream during home games as a fund raising activity for DC Live and Catalina Island. This activity is led by Mrs. Nord, Social Studies teacher and Mrs. Christ, Math teacher. The first staff PLC (Professional Learning Community) meeting in Magma was held on the first early release day, Wednesday, August 6th. Ms. Kelly Smith from the Office of Curriculum and Instruction discussed on tests for all subject areas. Teachers worked in teams and prepared a 5- minute presentation on Reteach and Enrich best practices using powerpoint, posters, and skits. Mustang baseball was on display for the first game yesterday as they faced Walker Butte. A great demonstration of defense was behind Jake and Jr. (Jose) for the first five innings. The Mustangs couldn't keep the momentum into the final inning as Walker Butte extended its lead . On offense, there were some bright moments as Octavio, Mark , Jr, and Dominique got in base with great contact from the plate. Unfortunately, the game ended too soon as the mustangs got into an offensive groove late in the game. Final score Walker Butte 7, Magma Ranch 1. Three Magma Ranch Pitchers combined to no hit the the Walker Butte softball team. Lindsay Lopez struck out 7, Raevynn Apodaca struck out two and Alyssa Brizuela closed out the final out on a grounder to first. also defensively Mckenzie Martinez played left field and a solid catching performance in her first A team game. Mustang bats were on fire, Mustang runners were running hard. Kayla Lopez and Makalya Etes in their Mustang debuts scored three runs each. Also in their debuts running well were, Kaylynn Ohlund, Brenley Ferdette, Stephanie Ortiz, Samantha Keefe, Nattie Murillo, and Trinity Harris... all scored one run. Also Kaylynn, Nattie, Trinity and Samantha collected their first hits as A team Mustangs. Siera Snow scored a run. Mckeyna Stouffer played center and 2nd in their A team debuts. Raegen Maoloy gave a tough pinch hit effort. Hitting triples were Lindsay and Raevyenn (2) . Lindsay also had a double. Hitting singles included Alyssa, Kayla and Mykayla (2). An opportunity was provided to Magma teachers to learn for the first time or refresh the TAP rubric in a training on Monday, August 4th. Mr. Foster, the master teacher for the school, led the discussion. Students in 6th, 7th and 8th grade levels selected the members of the Student Council on July 31, 2014. Prior to the election, candidates posted campaign posters around the school. Candidates also gave their speeches during the morning announcements. The Mustang baseball and softball teams are preparing for the season. This will start on Tuesday,August 5th ,2014 at home versus Walker Butte. Both games will start at 4:30 pm. Born in Florida, have lived in many states as a migrant child and worker but settled in Indiana in November of 1972. I could not stand the snow so I moved to Arizona in 2003. I have been in education for 15 years in several roles throughout K-12: teacher, assistant principal, principal, Administrator of Online High School, director of ELL and Migrant programs and Manager of Operations for six Online schools. I did not like the drive to Phoenix so I chose to come teach at Florence. I love it here! I chose education because it was the gateway out of poverty and gave me the ability to give back to those children like me. My interests are; sewing, oil painting, construction (yes, I’m a handyman woman) and spending time with family. My husband and I share four daughters, two grandsons, one granddaughter and two granddaughters on the way. I love teaching and building relationships around me that will benefit my students. I am native to Arizona, born and raised in Mesa! This is my fifth year teaching music and I love it! I became a teacher because I thought I could be a good role-model for our future generations, and because I believe music is a very important part of a child’s education. I am married to my wonderful husband Tim and have two children: Noah and Naomi. We also have a dog named Maddie. Music is a very big part of my life and I play many instruments, most of my talents lying in the area of piano. I also love to sing, and I don’t mind performing in front of people. Other than music I love swimming, running (when I get the chance), and spending time with my family. I grew up in Southern California, but have lived in 6 different states since birth. This is my first year teaching and I chose to become a teacher because I think I can help students to better understand the world around them and how they fit in that world. My personal interests include traveling (even to sunny old England for Spring Break! ), photography, reading, and looking at street views of different places around the world on Google Earth (I have literally spent hours doing this and, yes, I am using “literally” correctly). I’m very excited to spend my first year of teaching with the Magma team. Everyone has been so friendly and helpful here, I fear I may become spoiled. I am excited to be at Magma Ranch for my 5th year after a one year break. Second grade is where you will find me with my fabulous team. My experience with teaching ranges from preschool to 2nd grade. With a few years of teaching in each grade. I am a mother of 3 wonderful boys. Adam an 8th grader, and Noah a 4th grader, who both attend Magma Ranch. My oldest son Jacob is junior this year and lives in Colorado with his dad. I love to read, play games, and spending time with my boys. I look forward to an awesome year and working with the wonderful staff and families here at Magma Ranch. Go Magma Ranch Mustangs! I am from Apache Junction, AZ. This is my first year teaching in the school system. I want to teach because I had some really awesome teachers and coaches. I wanted to be that for some people. I love language, culture, traveling, reading, exploring and find out new information. I’m super excited to teach this year and have been looking forward to it for a long time. I am so excited to be a part of the Magma Ranch K-8 Staff! I was born and raised in Southern California and just moved to Arizona. I earned my Bachelors of Arts in Social Sciences from Washington State University and am a huge Cougar Football fan! I obtained my Elementary Education Teaching Credential from CalStateTeach. I have two dogs, Tucker and Flip. I am excited for this year and know it will be great! I am from Clarkston, Michigan where I went to Siena Heights University. I have taught for 8 years beginning in North Carolina and then moving to the valley. I chose teaching as a career because I had amazing teachers growing up. They were so dedicated and inspiring. I wanted to be the same for my students. My interests are playing and coaching volleyball and spending time with my family and friends. I am from a very small town in Mississippi. I have lived here for about 12 years now. This is my third year teaching. I have two daughters. Keira is nine and in fourth grade. Kadence (Kady) is three and loves learning about dinosaurs. I decided to become a teacher because I wanted to give my daughters something positive to look up to. I like to cook. I like trying new healthy recipes. When I get a chance I play softball on a coed league. I am working on my Masters degree in Education and am a Girl Scout leader. I do not have much free time but when I do I love going camping with my seven brothers and sisters and all of our cousins and our kids. If there is anything you want to know about me feel free to ask. The parents/coaches/players meeting for baseball and softball was held on Tuesday,July 29th, in the cafeteria at 6:00 PM. During this meeting, Mr. Lopez and the coaches discussed the rules and some changes which will be in effect in the 2014-15 K-8 sports seasons. Players received their uniforms and other gears. The school conducts bus assemblies during the start of every year to encourage students to follow the bus rules. We want our students to be safe. During the assembly today, we introduced the drivers and the bus expectations. This year, for the first time, we did some role plays of improper and proper behavior on the bus. The students enjoyed the presentation and everyone had fun with the skit. Every year Magma bus referrals have gone down, from 104 in 2012 to 87 for 2013. We challenged the students to even lower that number more this year and they are ready for the challenge. Magma Ranch had a very high parent attendance during the Meet the Teacher night. Magma team was prepared and made sure to welcome the parents as they entered the building. Mrs. Candaleria (FUSD board member) and her family were in attendance and she had nothing but good things to say about the look of the school and teachers.